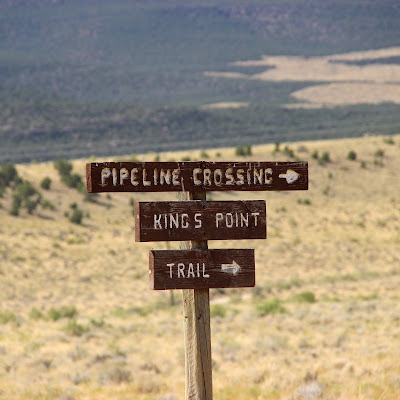 Near the end of my recent post about a geo-hike down Jesse Ewing Canyon in the eastern Uinta Mountains, I mentioned a pipeline. There was no way to miss it—it was clearly and emphatically marked. Pipeline route down Jesse Ewing Canyon into Browns Park. Uinta Mountains continue in the distance. 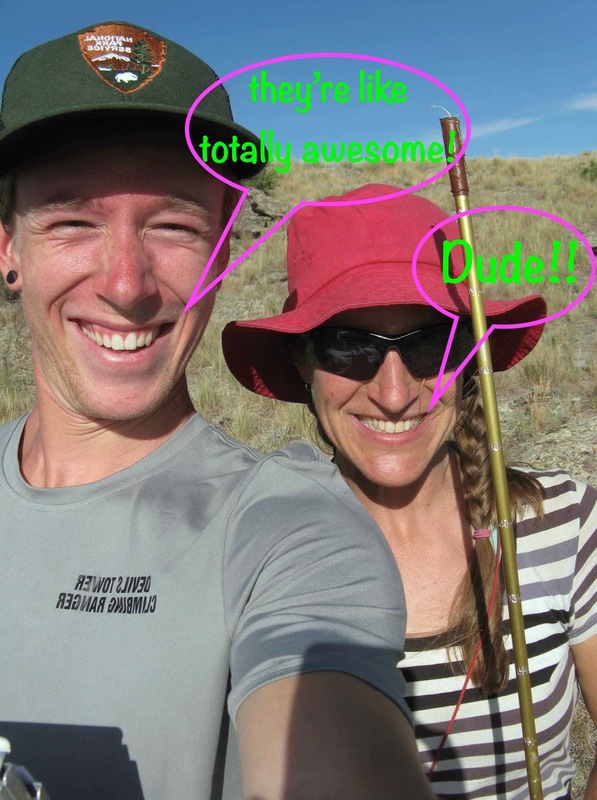 Why is CO2 sent down Jesse Ewing Canyon, across Browns Park, over the Green River and up into the Uinta Mountains? In fact, why is carbon dioxide being transported at all? 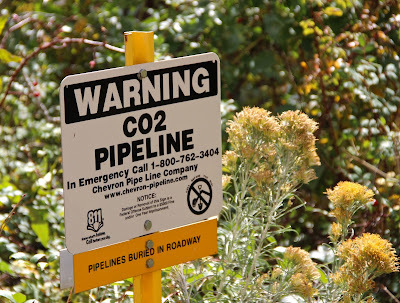 CO2 crosses the Green in a pipeline suspended above the river. 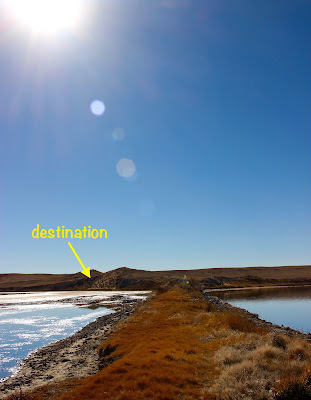 Arrow marks pipeline route above Browns Park, after crossing the Green River. My first thought was sequestration. Oil and gas extraction produces climate-warming CO2, and the industry is under pressure not to release it into the atmosphere. 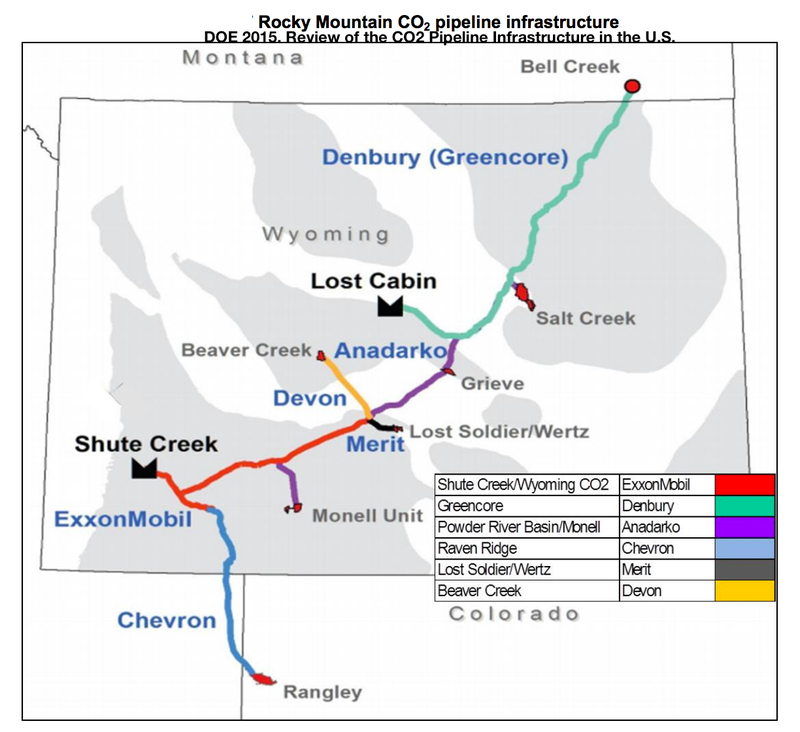 In Wyoming, we talk a lot about carbon capture and sequestration (CCS) … could this CO2 be going somewhere in the Uintas to be injected into suitable rock layers deep underground? Of course that would require Federal funding—sequestration is expensive! Or could it be that this CO2 is being somehow put to use? That’s what I asked a candidate for the Wyoming state senate, a passionate advocate for research on economically-viable uses of CO2. But like me, he was puzzled and guessed Federally-subsidized sequestration. But we were wrong. The CO2 is being put to use, specifically for enhanced oil recovery (EOR). It's sent to an aging oil field to extract a bit more oil. The CO2 originates at the LaBarge natural gas field in southwest Wyoming. 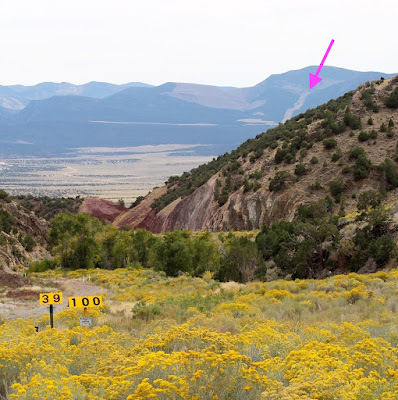 After being captured and processed, it travels southeast to Rock Springs, then south through Clay Basin to the head of Jesse Ewing Canyon in Utah. Next it descends to Browns Park, crosses the Green River, climbs a bit higher into the Uintas, descends, crosses the Green River again, and finally arrives at Rangely, Colorado, after a trip of 177 miles. 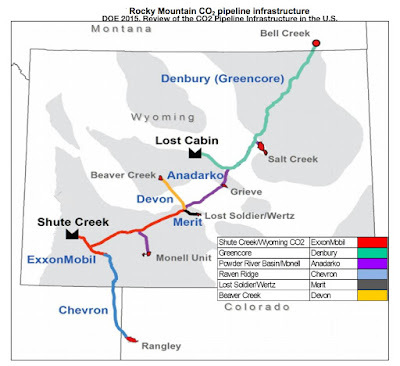 Bold line is the Rangely pipeline route (BLM 1984). 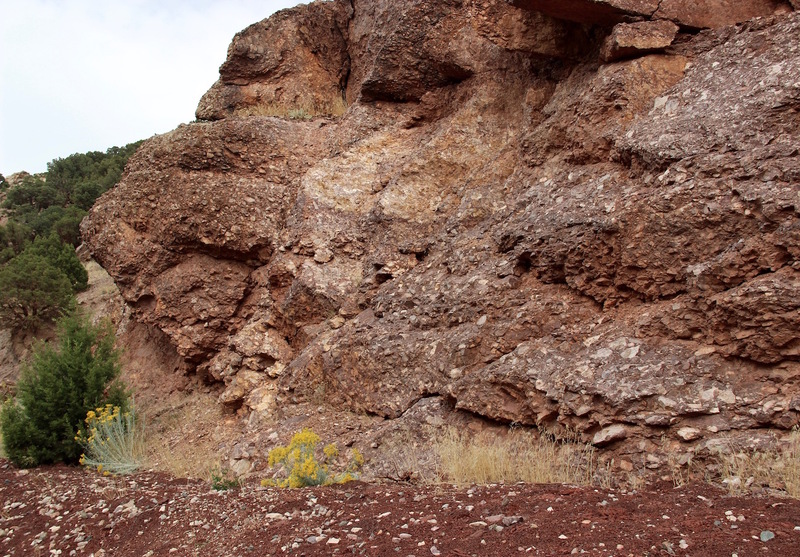 At Rangely, CO2 is injected 6000+ feet underground into the Weber Sandstone. 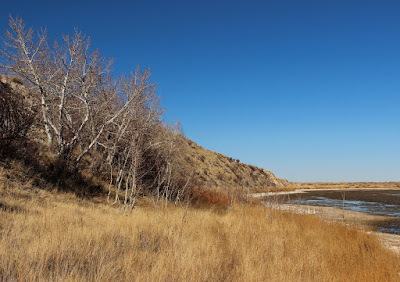 The Weber was once dunes and river sand, back during the time of the Ancestral Rocky Mountains 245-315 million years ago. 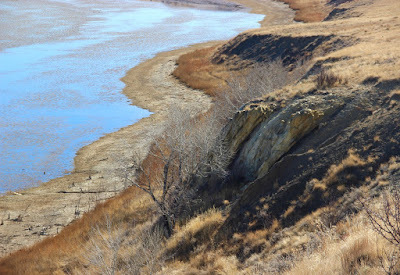 Several hundred million years later, after the sand had turned to rock, the Laramide Orogeny (uplift of the modern Rocky Mountains) folded the rocks to produce the Rangely Anticline—an elongate dome with multiple layers of trapped oil. The Rangely field is one of the largest in the US, “with cumulative production of about 900 million barrels of oil and 700 billion cubic feet of natural gas” (as of 2014; source). Serious production began in 1933 and peaked around 1955. 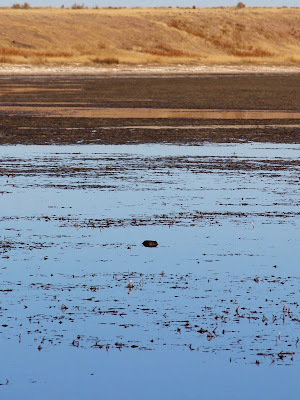 Since then, secondary (water) and tertiary (CO2) enhanced oil recovery have been used to coax more oil out of the ground. 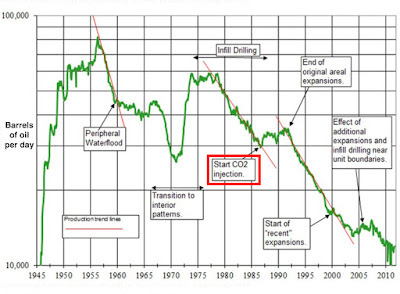 CO2 enhanced oil recovery started at Rangely in 1986. 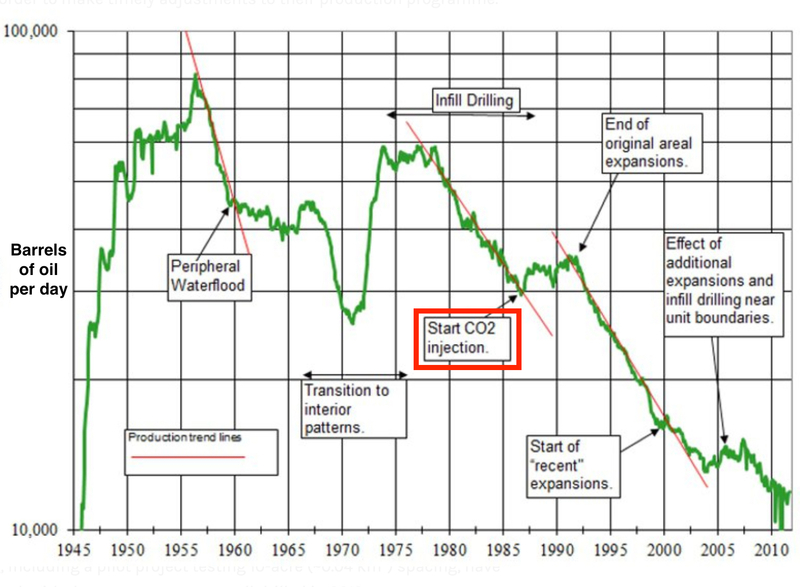 It didn’t reverse production trends longterm—the Rangely is mature and most of the oil is gone. But there was a shortterm increase, enough to justify expenditures. Originally from Chevron; found on multiple websites (see Sources). Earlier, I hinted that extra financial incentives drive carbon sequestration … is that true for enhanced oil recovery as well? Is it really profitable to buy processed CO2 and ship it 177 miles? 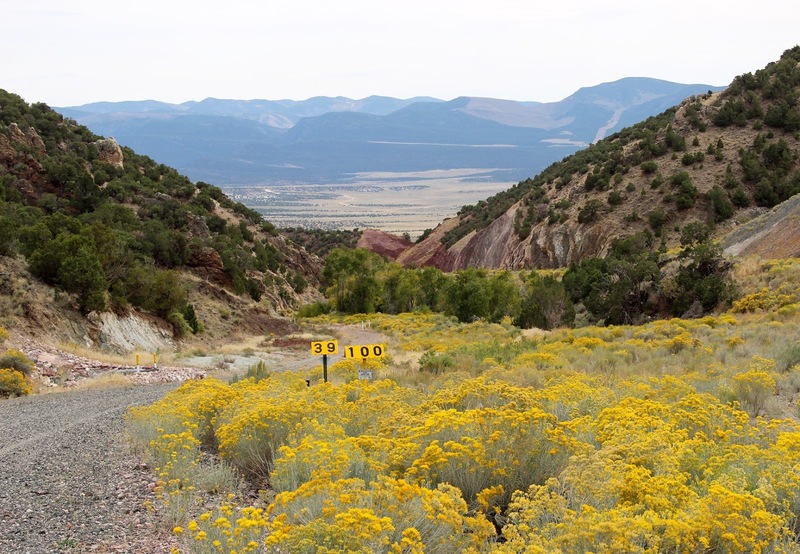 The Shute Creek (LaBarge) processing plant alone cost $70 million to build, and as of 2005, required $1 million per month to operate (CO School of Mines 2005). Not surprisingly, EOR is a balancing act strongly influenced by market forces. As of late 2015, CO2 was still traveling the 177 miles from LaBarge to Rangely (Smith 2016), suggesting EOR was still profitable. Our CO2 pipelines (Wallace et al. 2015). 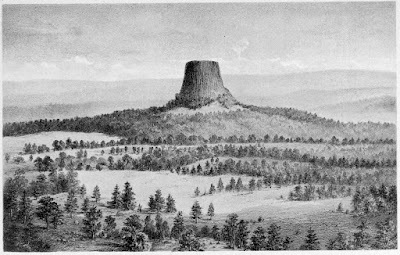 Devils Tower is so striking that Henry Newton and William P. Jenney featured it as the frontispiece in their 1880 Report on the Geology and Resources of the Black Hills of Dakota. So I guess I shouldn’t be surprised that my most popular blog post ever is Devils Tower—What’s on Top?, but I am. 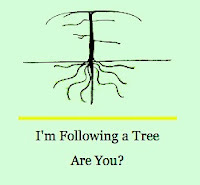 It’s not about rock climbing or spaceships, but rather plants and vegetation. How many readers really want to know that sagebrush, grass and wildflowers grow on the summit? I think folks land there by accident. In any case, it’s time for an update. In 1941, George Hopkins parachuted onto the summit, where he hung out for six days in grass, sagebrush and rocks before being rescued. NPS archives. 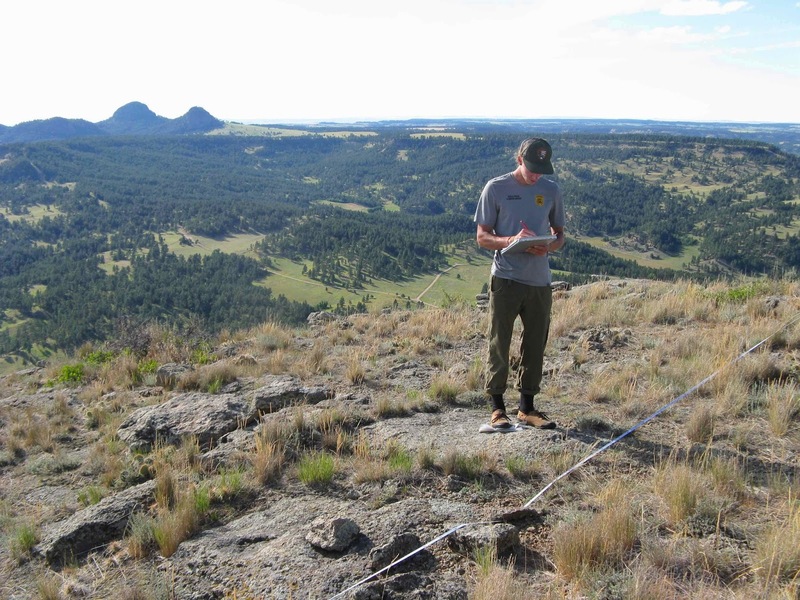 This year, the National Park Service contracted with us to inventory plants and assess summit vegetation. In a sense the project is “almost” done. However, I have to finish the report and I hate writing reports. I’d much rather be blogging. A few days ago, I had a brilliant idea—do both at the same time. Andrew and Cheryl commune with plants on top of Devils Tower. The top of Devils Tower is a rounded rocky hilltop. From the high point you wouldn’t know there were precipitous walls below if you hadn’t just struggled up one. 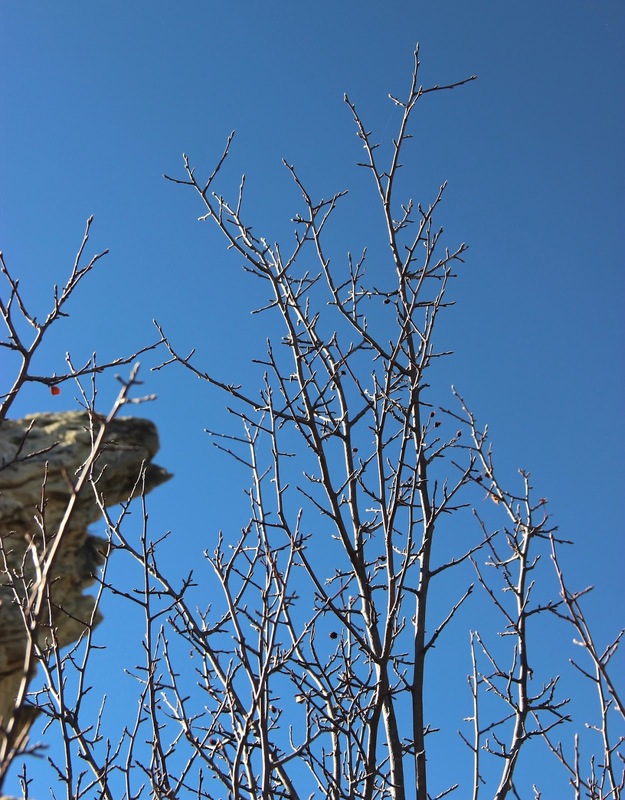 Plants are common among the rocks—in fact plant cover roughly equals that of bare rock. Skunkbush sumac bushes and clumps of bluebunch wheatgrass grow scattered across much of the summit. 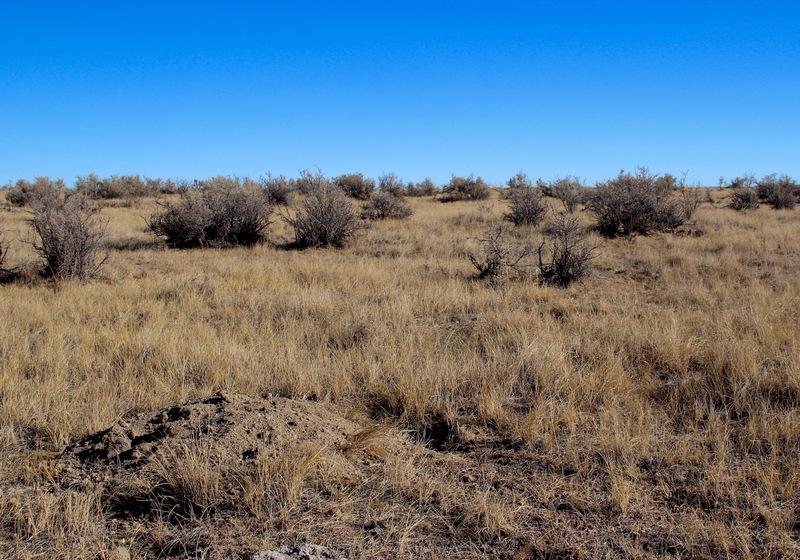 In the northeast part, where the soil is deeper, there’s a small but vigorous stand of sagebrush and grass. Andrew admires skunkbush and bluebunch wheatgrass among the rocks. How do plants get up there? Wind is the most likely means of seed transport. 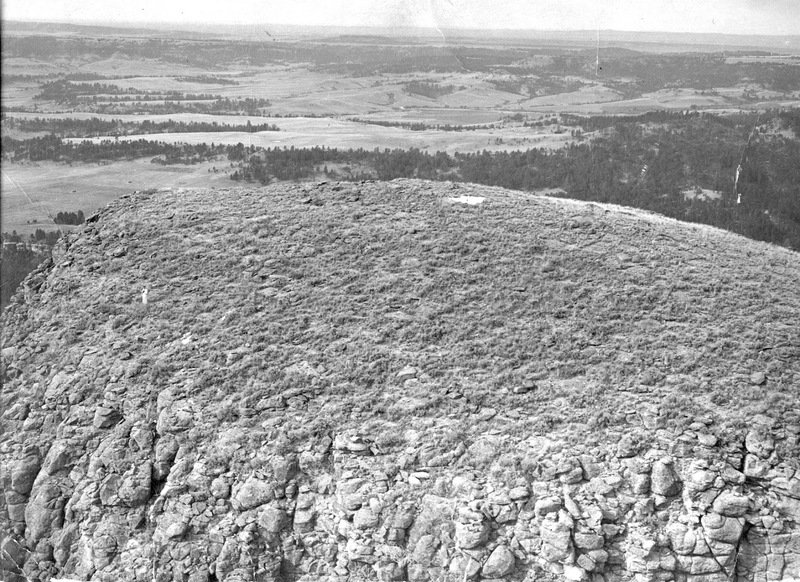 But small mammals climb Devils Tower too—chipmunks, packrats, and deermice have been seen on the sides and summit. Maybe they haul a few seeds up there on occasion. How can plants grow in rock? Over the long term, rocks are not as permanent as they look. They fracture, weather, and turn to dust. Dirt and debris slowly accumulate in small pockets, where seeds sometimes land. A few germinate; a few of these grow into plants. 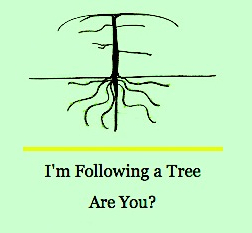 Their roots help break up the rock, one tiny bit at a time. It may seem unlikely that seeds will land in just the right place and survive, but obviously they have. 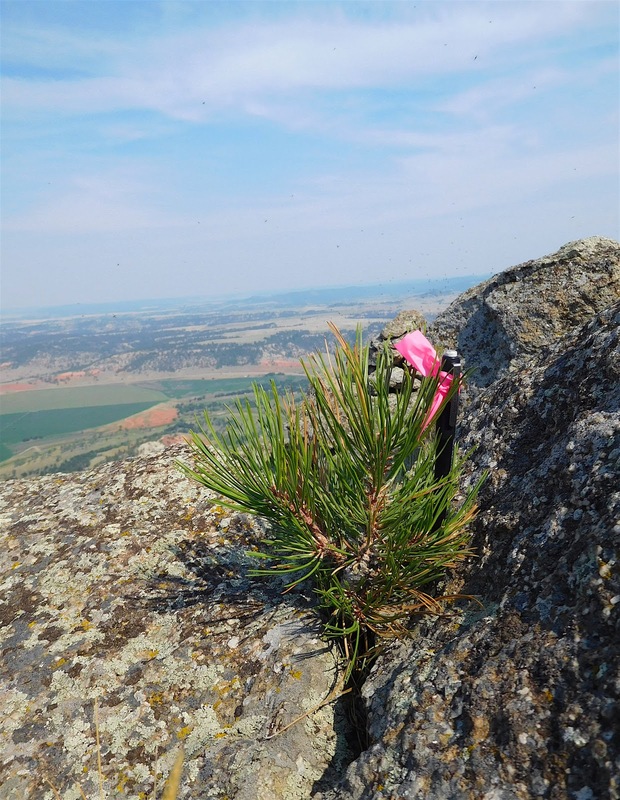 The top of Devils Tower is botanically diverse, with 53 species—impressive considering it’s only the size of a football field and really rocky. 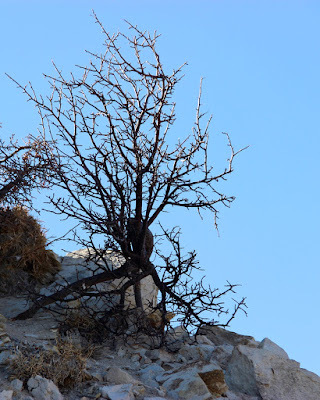 At first glance, the summit looks dry and harsh—hospitable only to hardy drought-tolerant grasses and shrubs. But there are lots of favorable microsites. 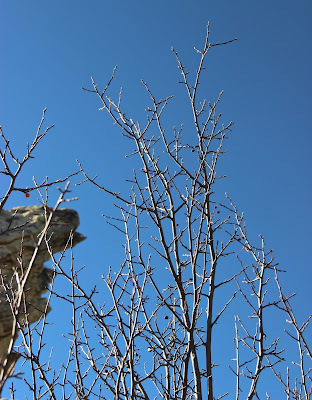 Thirteen plant species on the summit grow only in the shade of rocks and shrubs. 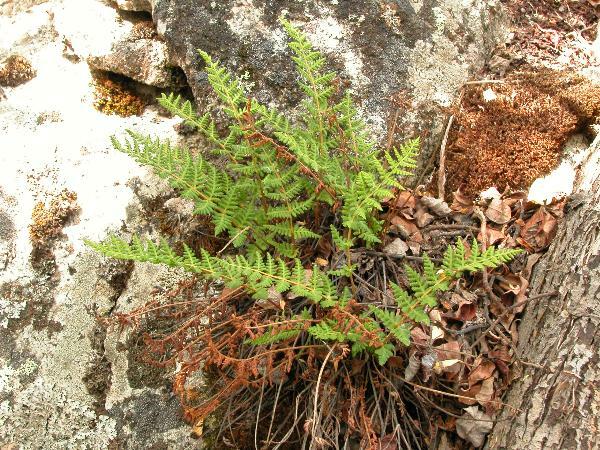 Ferns grow in crevices with shade and soil … and a bit of flowing water when it rains. 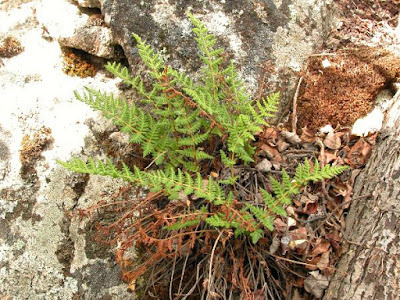 Rocky Mountain cliff fern (Woodsia scopulorum). ©Adolf Ceska, used with permission. In late spring, the summit turns green with grasses and wildflowers. Some of the showier species are sego lily, prickly pear cactus, harebell, western yarrow and wild onion. 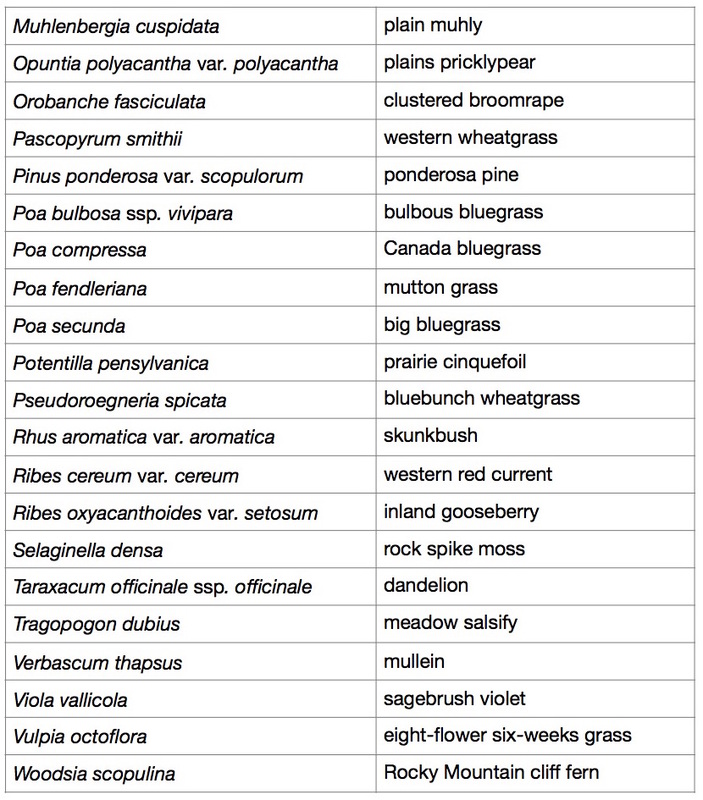 Common grasses include bluebunch wheatgrass, needle-and-thread, and blue grama. 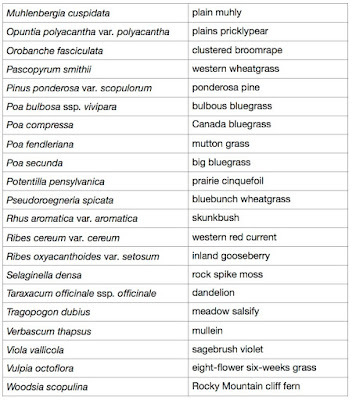 Shrubs are common too, especially skunkbush sumac and Wyoming big sagebrush. Are any plants unique to the summit? No—all grow in the surrounding area too. However, Wyoming big sagebrush is much more common on the top of Devils Tower than anywhere else in the Monument (it’s extremely common further west in the basins of Wyoming). 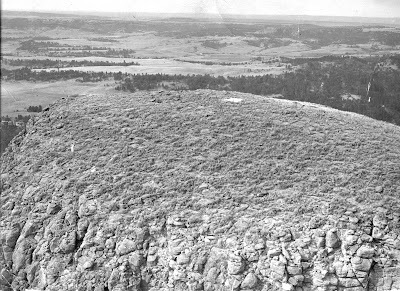 Sagebrush grassland on top of Devils Tower; skunkbush sumac lower left. Plains prickly pear (Opuntia polyacantha) by Sally and Andy Wasowski. When the large waxy yellow flowers of prickly pear cactus bloom, everyone notices. Otherwise it’s drab and easily overlooked, and painful when accidentally bumped! 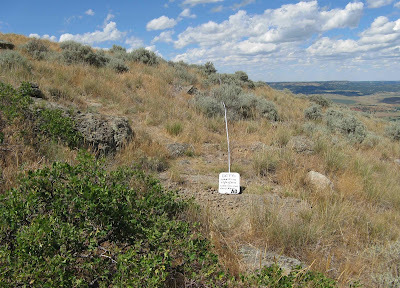 Two different kinds of sagebrush grow on the summit: Wyoming big sagebrush and fringed sage. 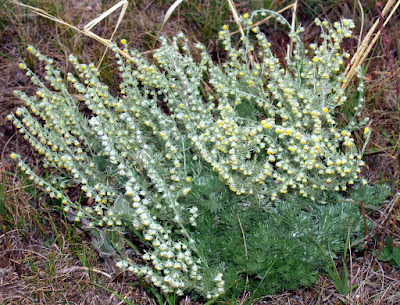 Sagebrush is not related to the sage we use in cooking, but was named for the sage-like fragrance of the leaves. Wyoming big sagebrush (Artemisia tridentata ssp. wyomingensis) by Stan Shebs. Its leaves are 3-toothed at the tip, as the scientific name points out (“tridentata"). 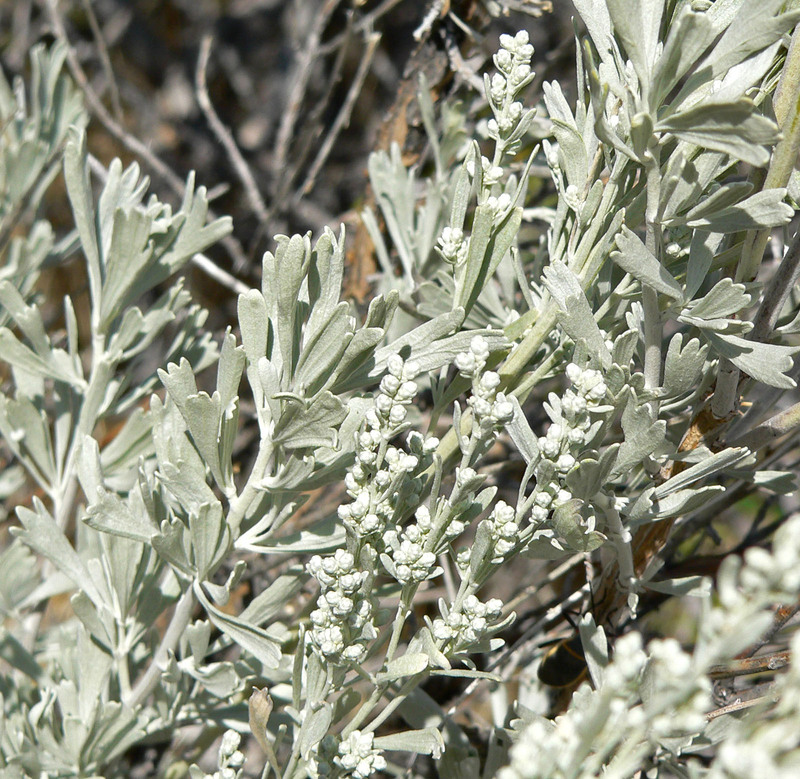 Fringed sage (Artemisia frigida) also lives up to its name. The leaves look “fringed” because they’re divided into fine segments (NPS). The 3-parted leaves of skunkbush sumac suggest poison ivy, and indeed, the two are close relatives. But this sumac is not at all poisonous. 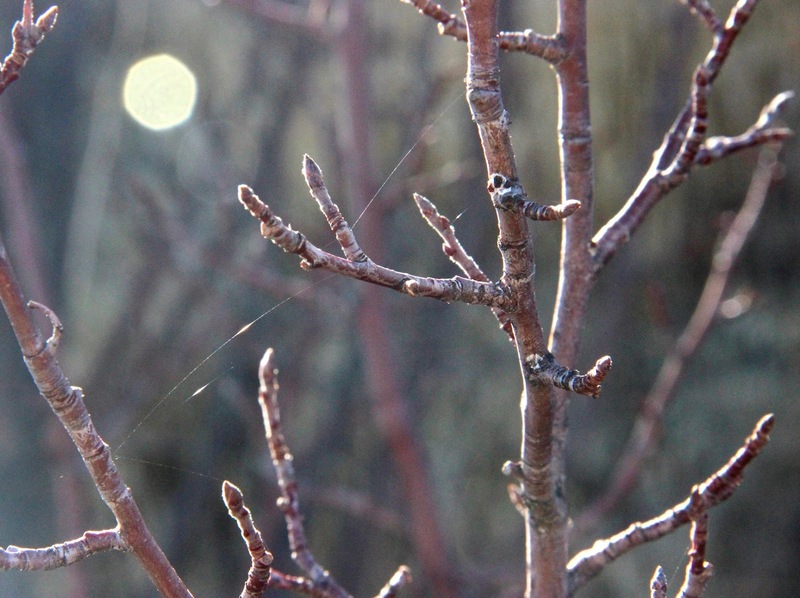 In fact, its twigs have long been used to make a citrus-flavored tea. The appealing fragrance explains the scientific name—Rhus aromatica. Skunkbush sumac (Rhus aromatica) by Joseph A. Marcus. 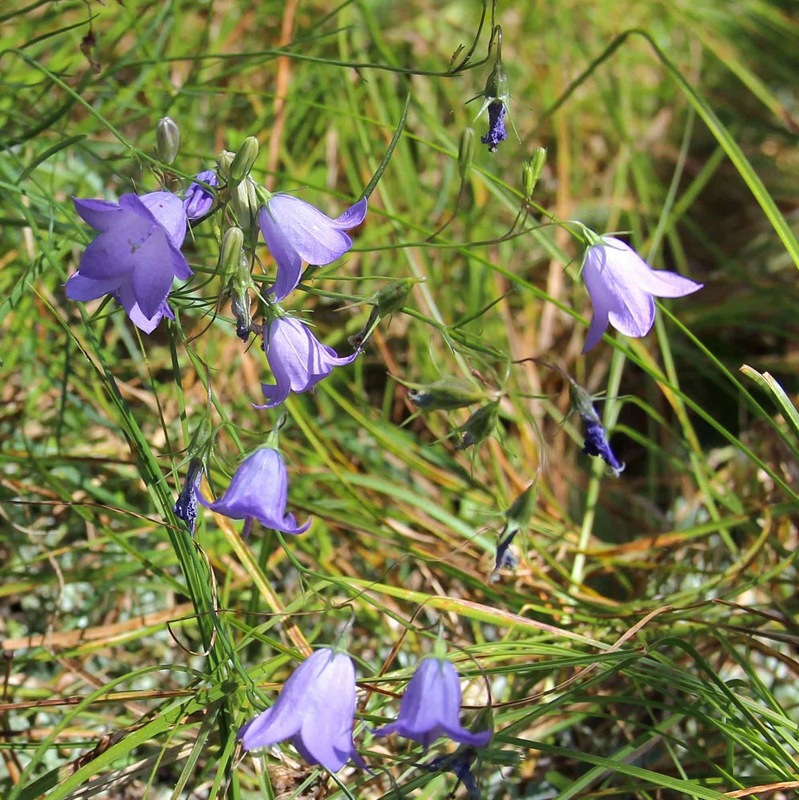 Harebells look delicate, but they’re actually quite tough, surviving even where there’s very little soil. 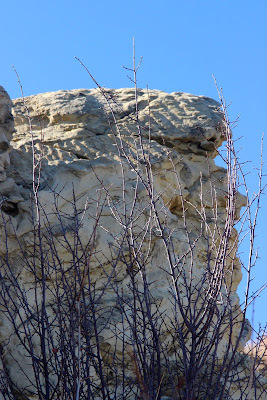 They grow in cracks on the sides of the Tower, and among rocks on top. Harebells (Campanula rotundifolia). 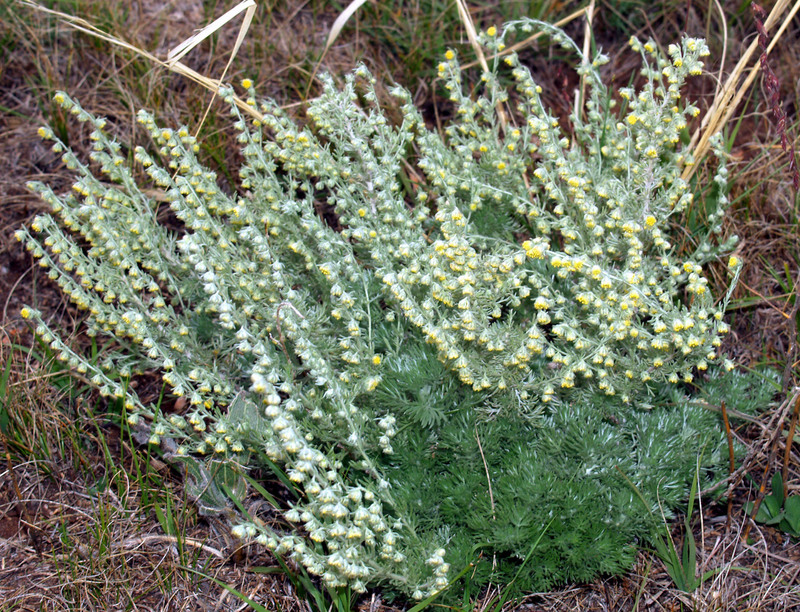 The scientific name refers to bell-shaped flowers and small round leaves. 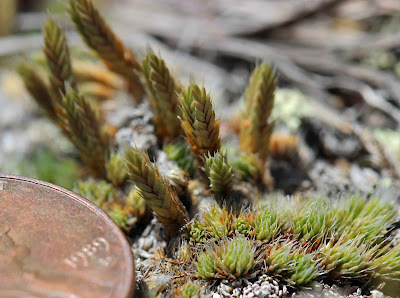 One of the more common plants on the summit is rock spikemoss, but it’s rarely noticed. It’s a close relative of the resurrection plant, and behaves in a similar fashion. Rock spikemoss grows and produces spores during favorable conditions in late spring and summer. 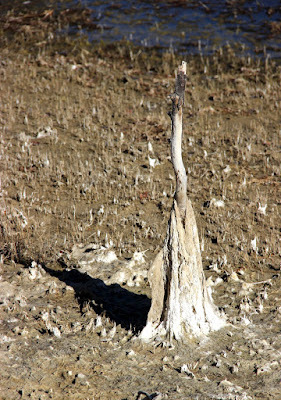 Then it lies dry and dormant, looking quite dead, as it awaits “resurrection” with next year’s spring moisture. Rock spikemoss (Selaginella densa) is not a true moss but rather a relative of ferns. No one expects to find trees on top, but there is one. 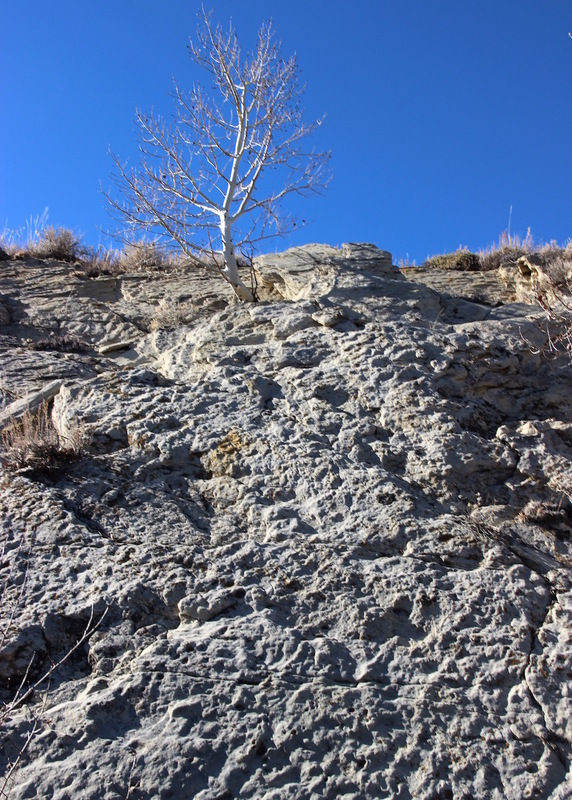 A ponderosa pine has managed to survive on minimal soil and water in a crack. Never underestimate a plant! 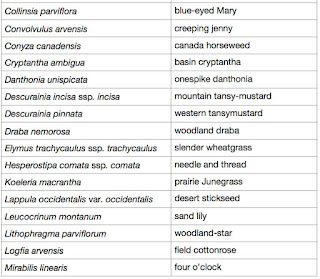 One more question—what do you think about including scientific names? 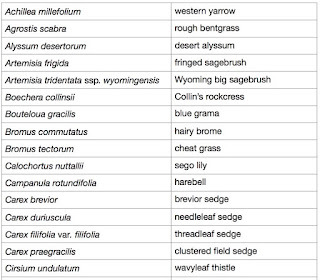 Botanists like them, as they’re information-rich. But others find them off-putting. 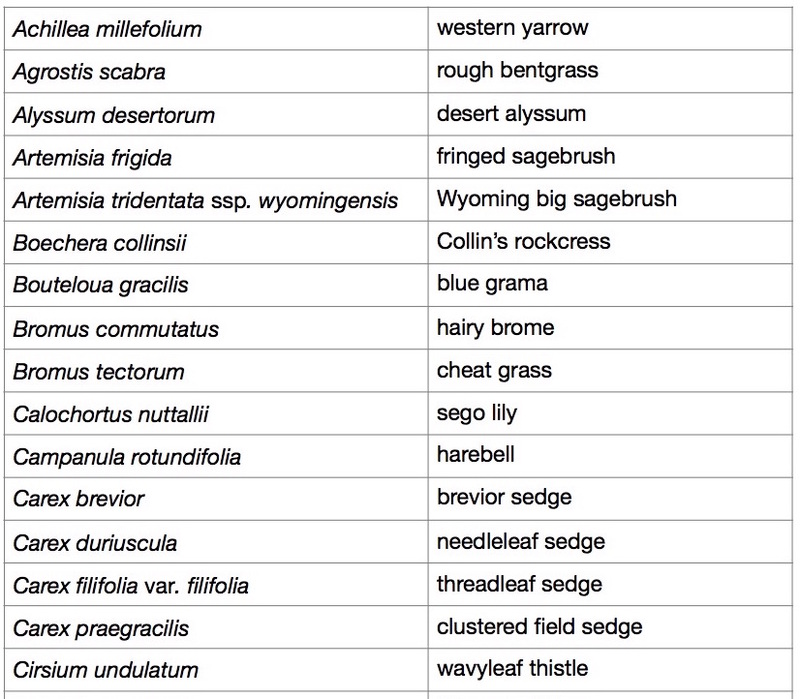 Here’s the current list of summit plants. About thirty were known prior to this project. 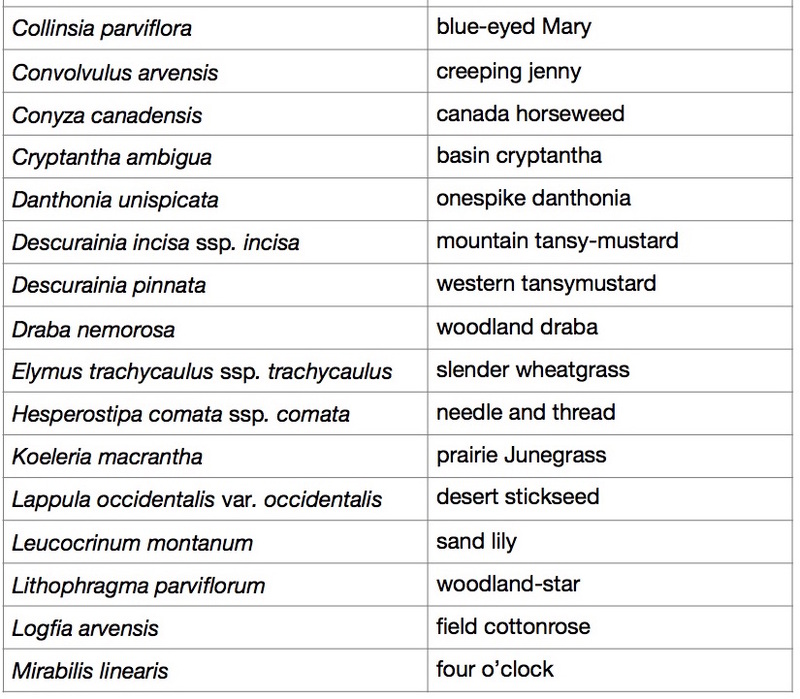 After systematic careful searching—three visits scattered through the growing season, 20 person hours in all— the known vascular plant flora now stands at 53 species. This month’s gathering of tree-followers coincides with an unfortunate event in American history, culminating months (or was it years?) of depressing “discourse” on both sides. Is it time to leave? They say the Canadian immigration website crashed Tuesday evening, overwhelmed by US traffic. But I don’t want to leave, I like it here! I think I will go back to the Misty Mountain instead, if I can find the way. The Misty Mountain is metaphorical—a composite of wild places and other patches of nature. I moved there forty years ago after paying off my student loan, but at some point I fell off, landing on the Human Highway. Is it possible to return? We’ll see. The journey started at Hutton Lake, with a visit to the serviceberry I’ve been following since January. It grows in an unexpected forest along the south side of the lake, on the shady north side of a ridge of steeply-tilted sandstone. A cool but sunny calm day (yes, calm!) 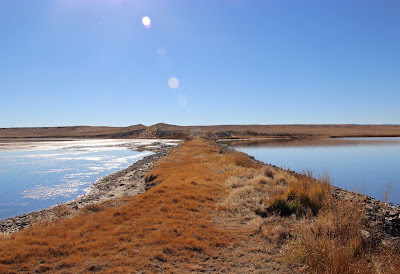 in the Laramie Basin. Dry brown November landscape, with greasewood and grass. 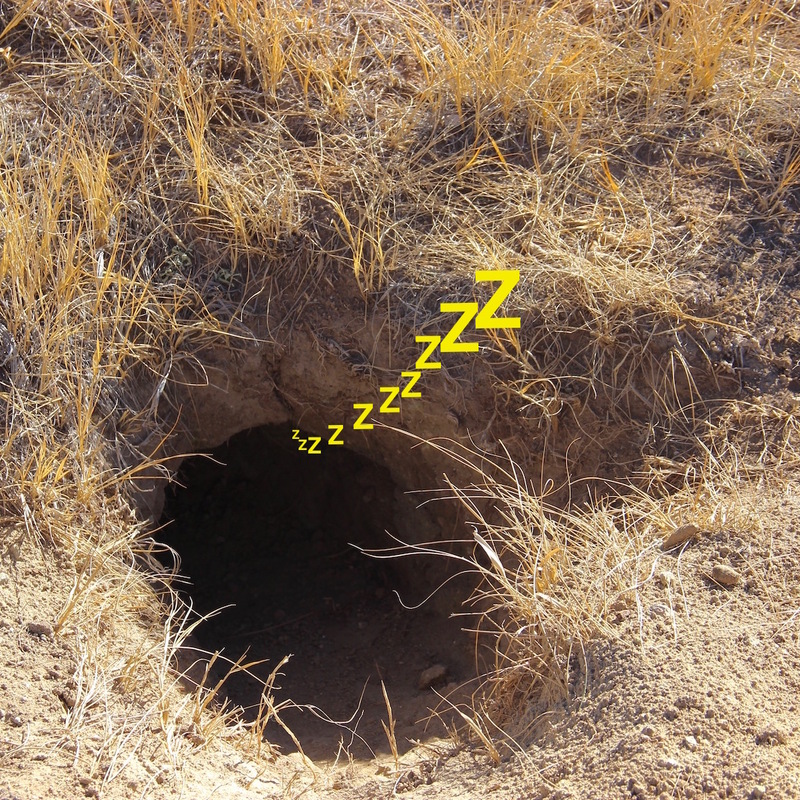 The prairie dogs are all hibernating, maybe dreaming of tasty green herbaceous plants. 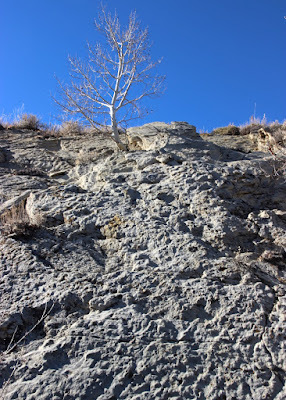 I reached the ridge and hiked along the crest, then descended to lake level and strolled through the tiny forest. Bare aspen, cottonwood and serviceberry trees, with tilted sandstone. 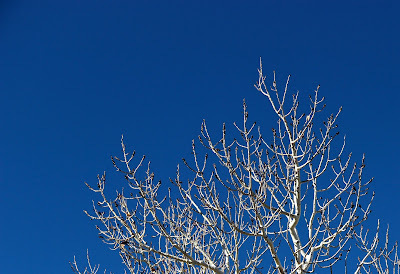 Lots of buds on the aspen trees ... they're ready for next year! Fossilized ripples on a 100-million-year-old beach. It was uplifted and tilted when the Rocky Mountains rose. 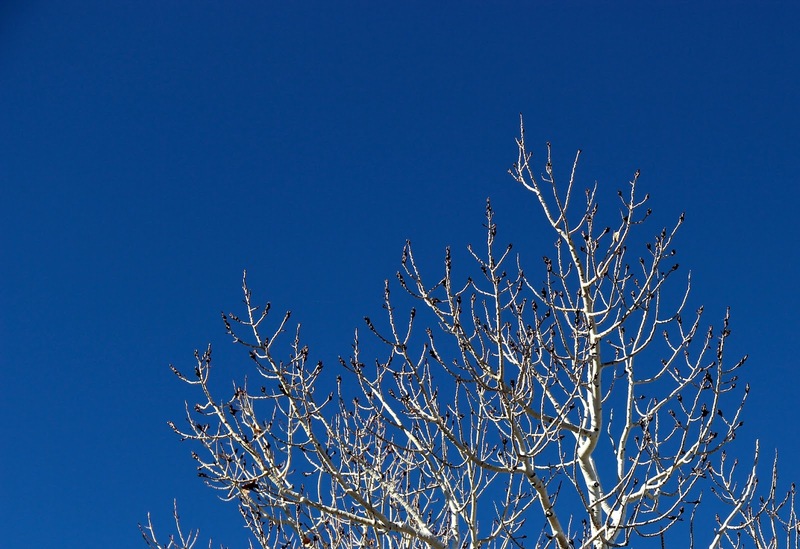 Aspen sapling survives on rainwater that accumulates in cracks. 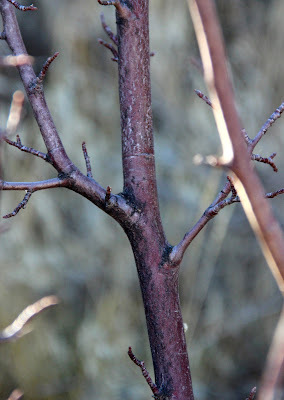 My serviceberry tree was bare of leaves and berries, looking pretty much as it did back in January when we met. My tree and more ripples. 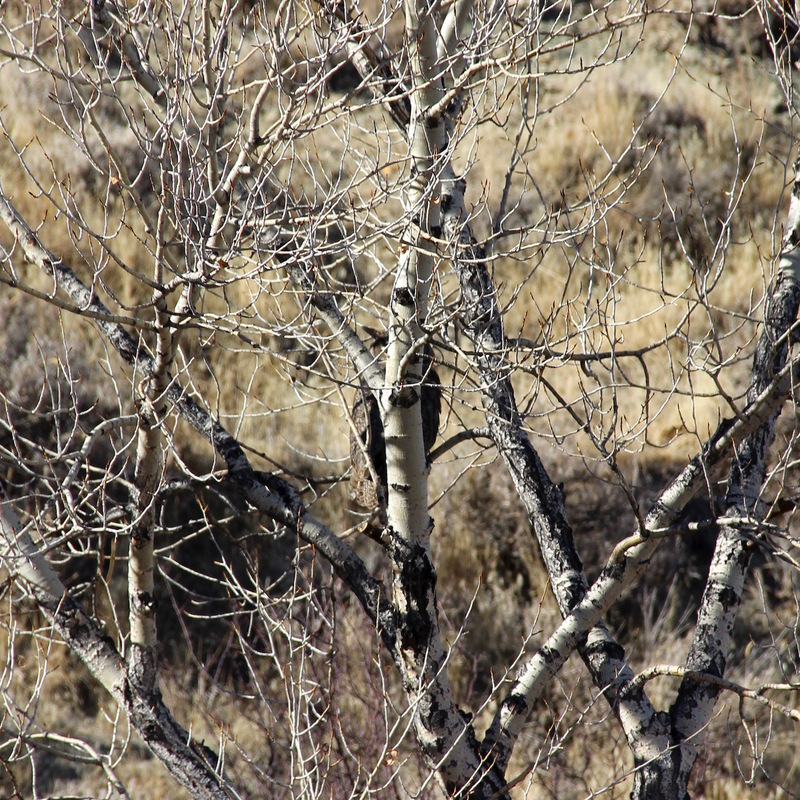 Then a large brown object swooped down from the sky and landed in a cottonwood tree nearby. Who hoo hoooo is this?! Click on photo to view (center). Did I wake her? I thought she preferred to fly at dusk. 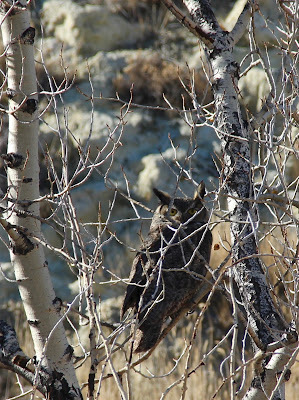 It was an eared owl of some kind (“ears” are tufts of feathers), maybe a long-eared. Do you know? 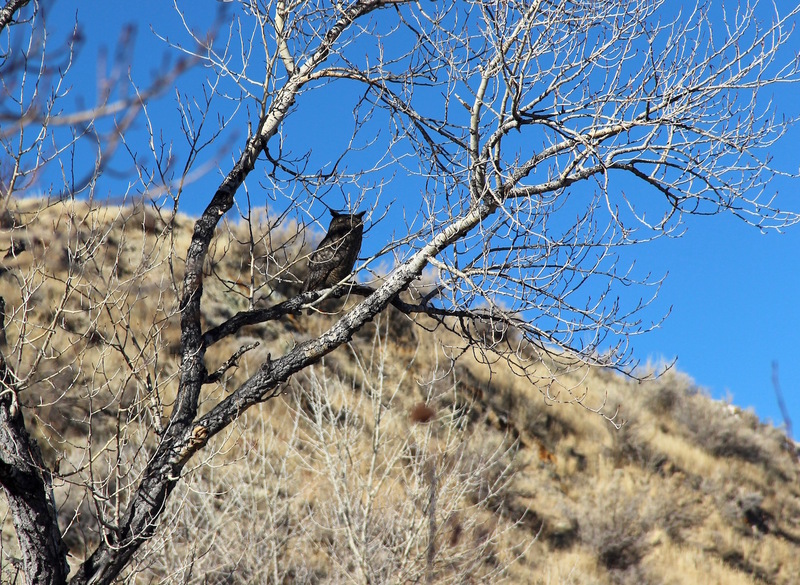 I think this is too slender an owl to be a Great Horned, but I’m no expert. [UPDATE: great horned owl after all.] She hung out while I photographed the serviceberry, changing her perch occasionally. When I left, she was still there, watching. ... and past castles rising from lakeshore muck. Are these homes of fairy creatures? I wish! 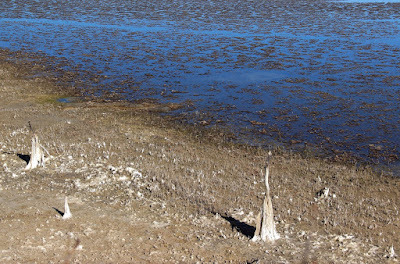 But no, just dead aspen saplings from years back, when the lake was lower. 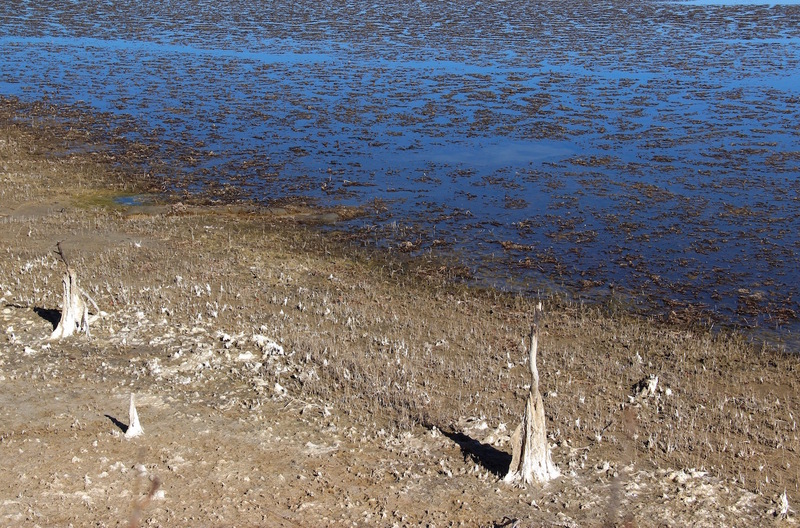 Now they're wrapped in salt-encrusted decaying aquatic plants. The lakeshore has a rich aroma this time of year. 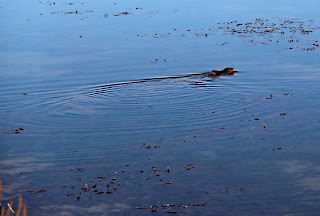 Next I met a muskrat. 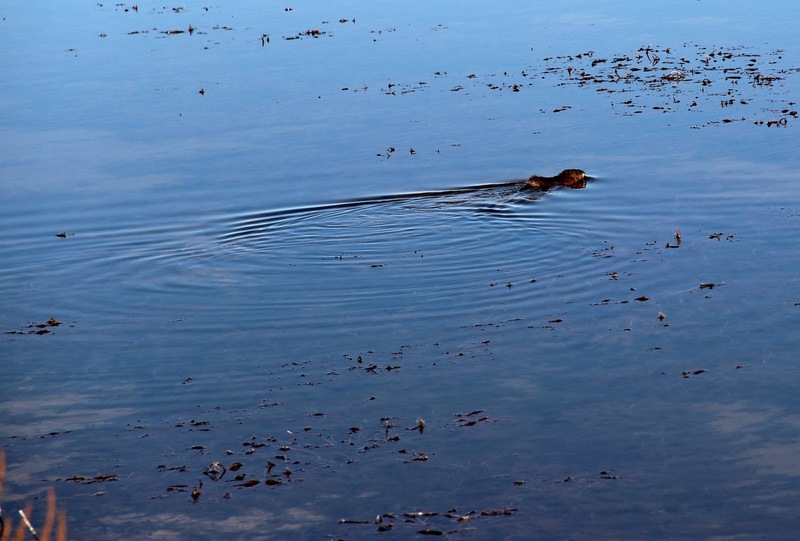 He was much more cautious than the owl and quickly dove, leaving a circle of ripples. I sat on the bank hoping he would return. Finally he did, staring at me just long enough for another photo before diving and swimming off again. I left so he could continue whatever business he had going there. 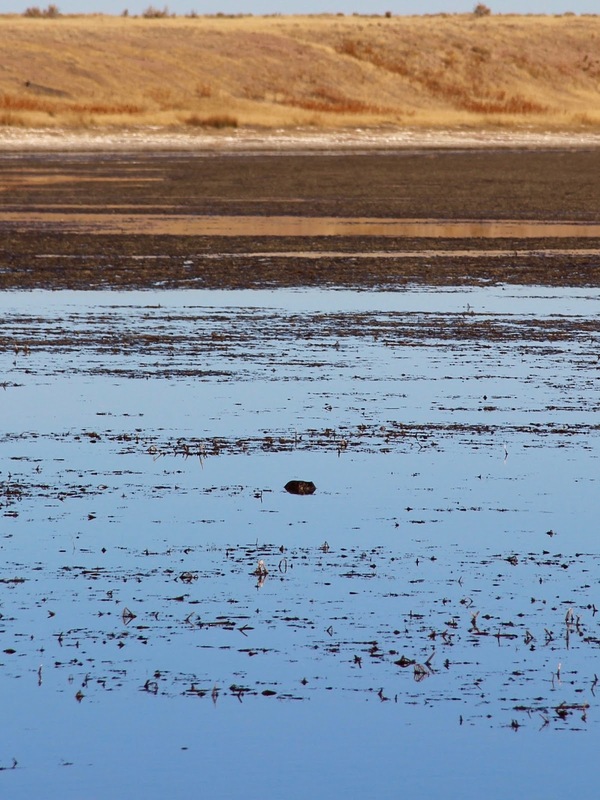 Cautious muskrat watching me (center of photo). This is my November contribution to the monthly gathering of tree-followers hosted by The Squirrelbasket. Read the latest news, and consider joining us ... it’s always interesting. Jesse Ewing Canyon down to Browns Park; highly recommended! I knew there was a problem when I saw a sign warning of a 14% grade—it should have been 17%. And there was pavement where there should have been gravel. The road had changed. The drop in grade meant it was longer and mileages in the guidebook no longer applied. How would I know what I was looking at?! Even worse, the new road might bypass the ancient rocks of Jesse Ewing Canyon altogether. But my fears were unfounded. 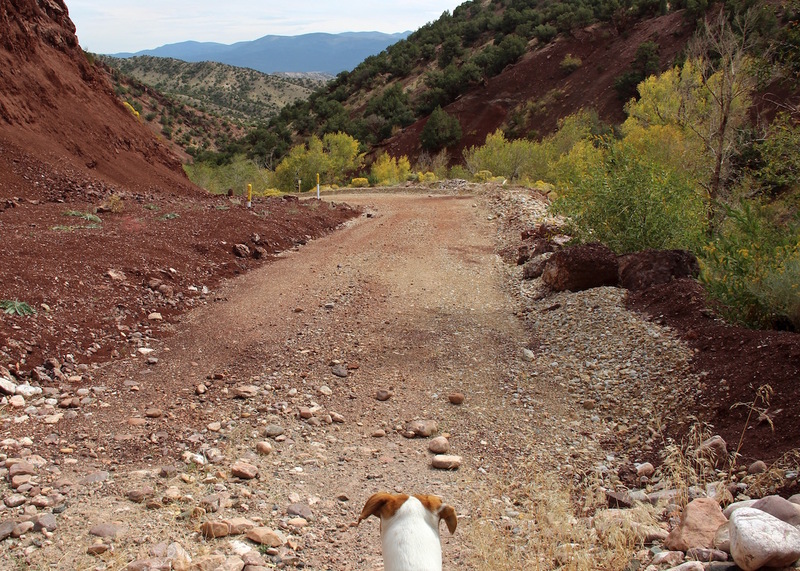 The Browns Park Road had indeed been rerouted, but as a result, Jesse Ewing Canyon is now a great geo-hike. Instead of trying to pull off a steep narrow road, we strolled down the canyon, stopping to ponder the remains of the ancient Red Creek mountain range, a substantial unconformity, and the magnificent conglomerate at the base of the Uinta Mountain Group. The Uinta Mountains are part of the Rocky Mountains, having been uplifted during the Laramide Orogeny around 70-40 million years ago. The western half is known as the High Uintas—there are 26 peaks 13,000+ feet in elevation, including the high point of Utah, Kings Peak. Pleistocene glacial features are common. 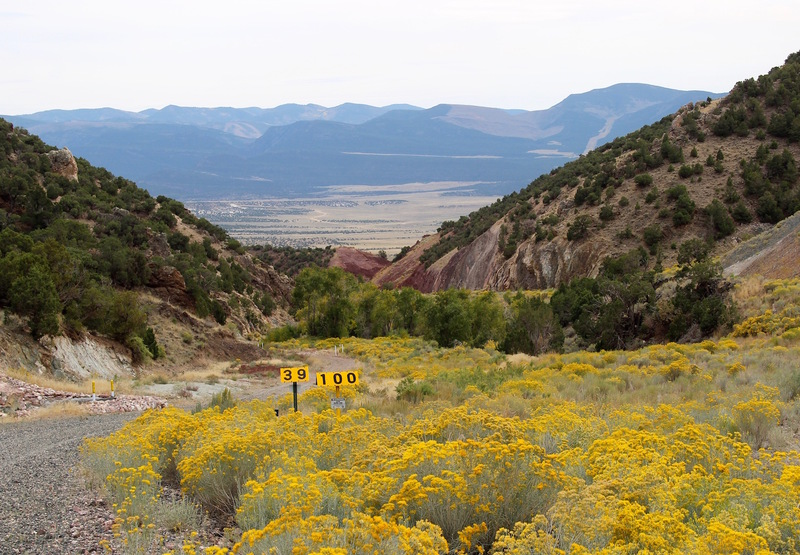 Late Precambrian sandstones and quartzites dominate the high country. Uinta Mountains (from Atwood 1909, labels added). The eastern Uintas are different. They max out at only 9710 feet (Diamond Peak), were not glaciated, and are more complex structurally. And Precambrian rocks are older—in a few places much older, for example in Jesse Ewing Canyon. 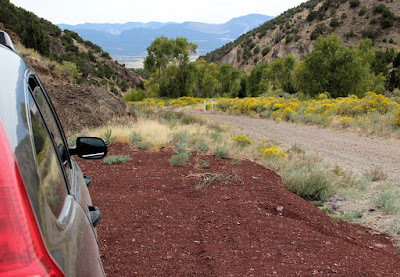 I drove up the new paved road on a giant switchback, which explained the reduction in grade. 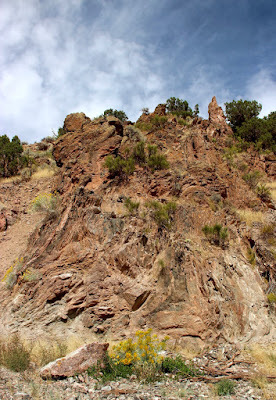 Several road cuts displayed contorted multi-colored rocks, but there was no place to stop. At the top of the climb, I parked in a gravel pullout which turned out to be the old road, now closed. This was the start of the Jesse Ewing Canyon Geo-hike. Start of geo-hike. Browns Park and more of the Uinta Mountains in the distance. 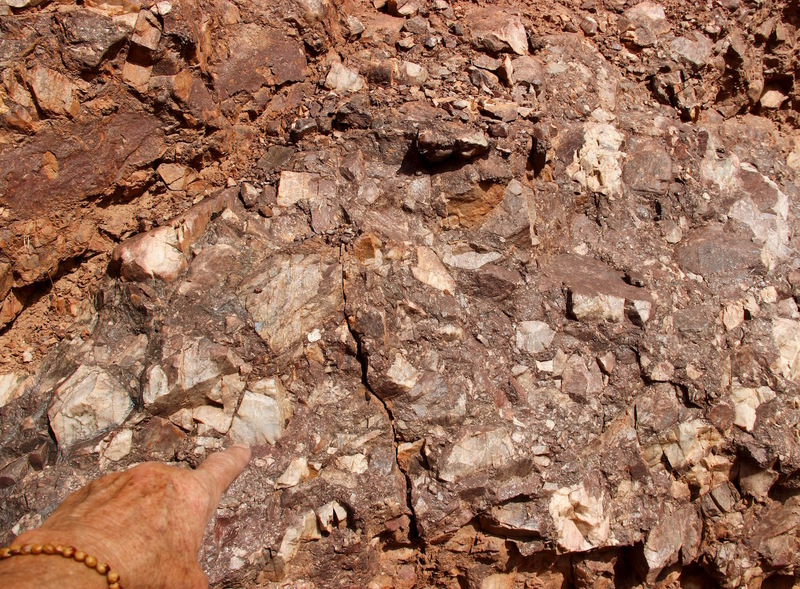 Less than a quarter mile down the old road were the rocks I was looking for—a mix of quartzitic and schistose rocks of the Precambrian Red Creek Quartzite. 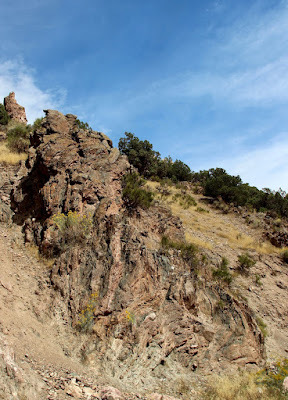 The outcrops are modest, but their story is impressive—mind-boggling actually. These are the remains of mountains that disappeared in the far distant past. A billion years ago, they had been eroded nearly flat; 500 million years later they were buried deep in debris. Tens of millions of years ago, faulting and erosion exposed them, but only in this part of the Uintas. Early geologists were puzzled as to why these rocks occur only here. 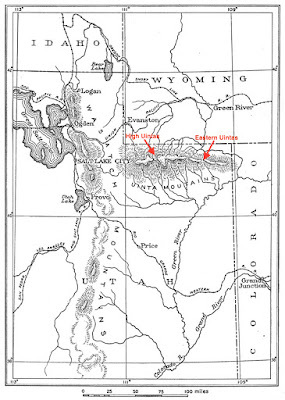 From 1868 through 1871, the Uinta Mountains were crawling with geologists … ok, there were only three, but they all were key figures in the geological exploration of the western US: John Wesley Powell, Frank Emmons (working for Clarence King), and Ferdinand Vandeveer Hayden. Why did the US government fund three nearly simultaneous expeditions into the Uintas? Maybe it was because of the spectacular geology. Or maybe these men had powerful connections in Washington DC. 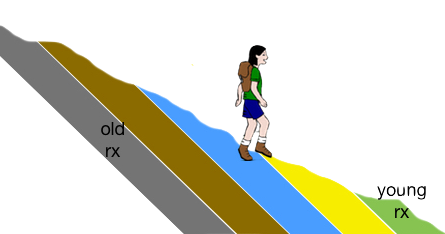 Orderly rocks, following Steno’s Law of Superposition. Same rocks, after uplift (tilting) and erosion. … ok, now we can keep going. Darker rocks beyond the Red Creek Quartzite are much younger, but still Precambrian. 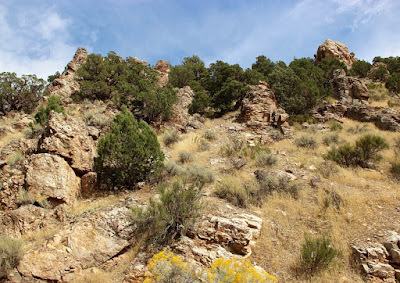 Atop the Red Creek Quartzite (but down the road) lie basal rocks of the Uinta Mountain Group (UMG). 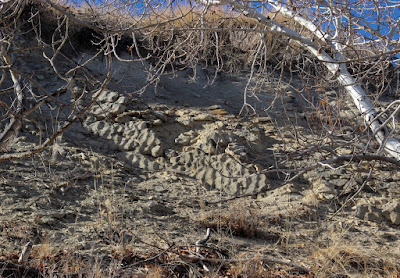 Like Red Creek rocks, the UMG dates from the Precambrian. But to leave it at that—and thereby suggest proximity in time—would be misleading. 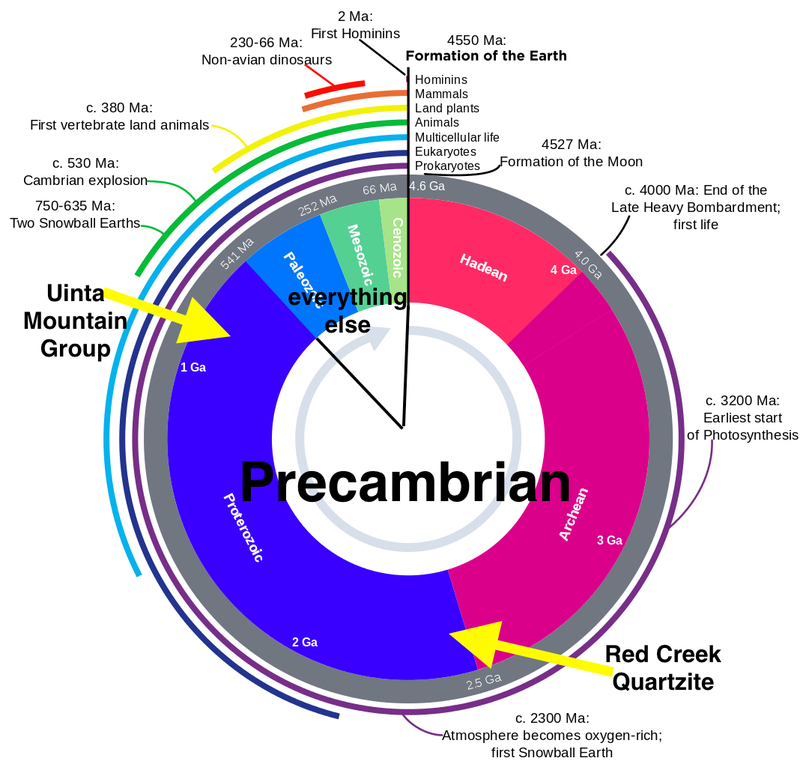 The Precambrian is an immense span. It includes the first four billion years of Earth history—out of 4.6 billion total! Geologists used to relegate this distant mysterious time to one gigantic eon, but now the various episodes are being teased apart, and the Precambrian has become a subdivided Supereon. Geologic clock showing Red Creek Quartzite and much younger UMG (source; labels added). 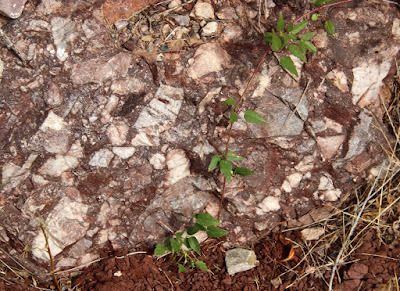 The Red Creek Quartzite has been dated at 2.3 billion years, which places it in the Paleoproterozoic Era. It may be even older—latest Archean. In any case, it formed roughly mid-Precambrian. 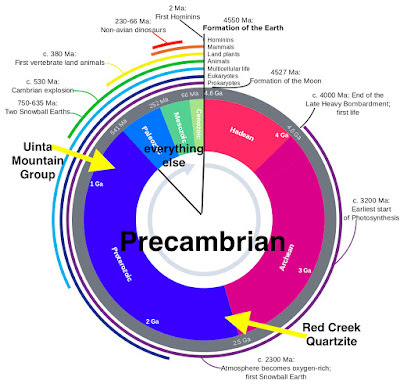 In contrast, the UMG is only 850 to 720 million years old, from the mid-Neoproterozoic—not all that long before the Precambrian Supereon came to an end. Between the Red Creek Quartzite and UMG is a major unconformity—a gap in the rock record of almost 1.5 billion years. This draw marks a 1.5-year gap in the record. 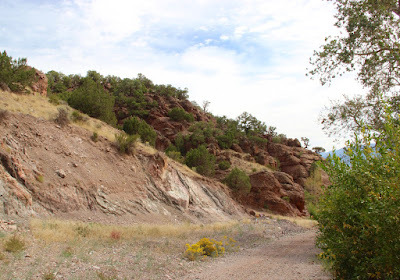 Feels like a Great Unconformity to me! UMG rocks started out as sediments washed into in a continental rift, perhaps when the supercontinent Rodinia was coming apart. 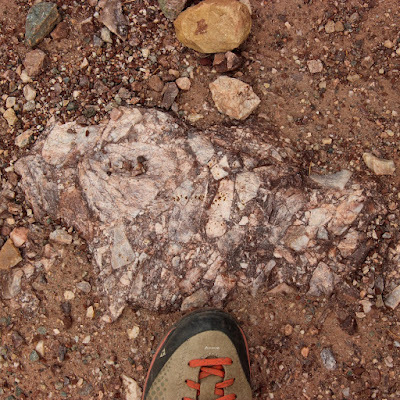 This went on for 100+ million years; the resulting accumulation may be as much as 25,000 feet thick! 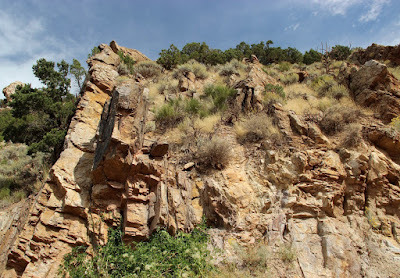 Rocks range from sedimentary—mainly sandstone with some siltstone and conglomerate—to metasedimentary and metamorphic—mainly quartzite of various grades. 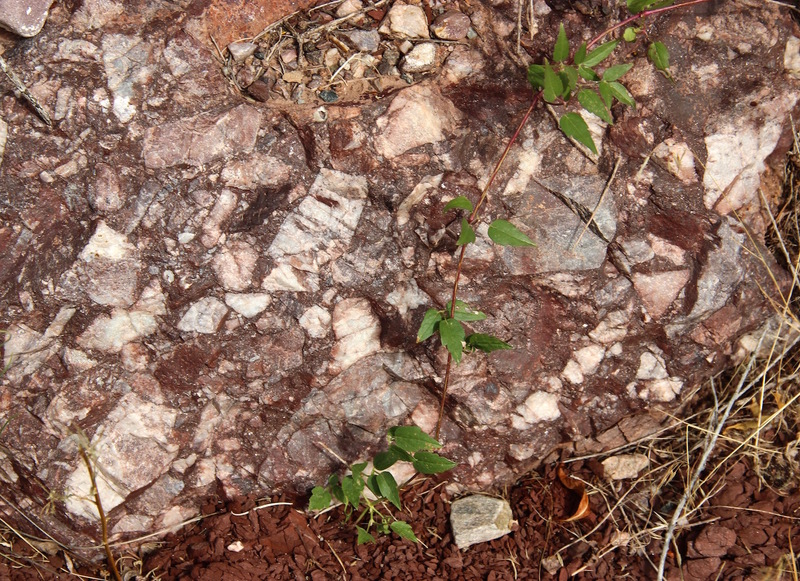 Like the Red Creek Quartzite, the oldest (basal) rocks of the UMG crop out only in the eastern Uintas. 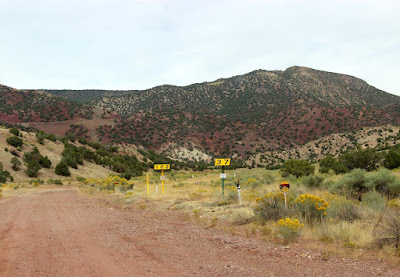 They are beautifully exposed in Jesse Ewing Canyon—large pale quartzite clasts are set in a dark red to maroon matrix. The first debris to wash into the developing continental rift was dominated by large angular fragments from the Red Creek mountain range. Size and shape indicate they didn’t travel far. The distinctive conglomerate has been designated the Jesse Ewing Canyon Formation. Conglomerate, with virgin's bower (Clematis). The conglomerate itself has been fragmented. Here's a piece in the old roadbed. Down the road, the conglomerate gave way to younger finer-grained rocks, mainly reddish-purple sandstones. 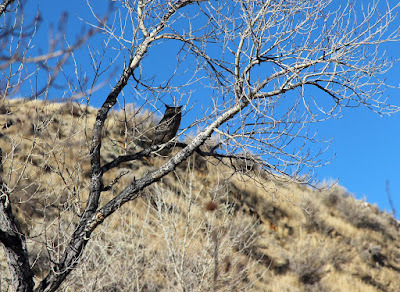 They continued to the lower end of the canyon—all part of the UMG. 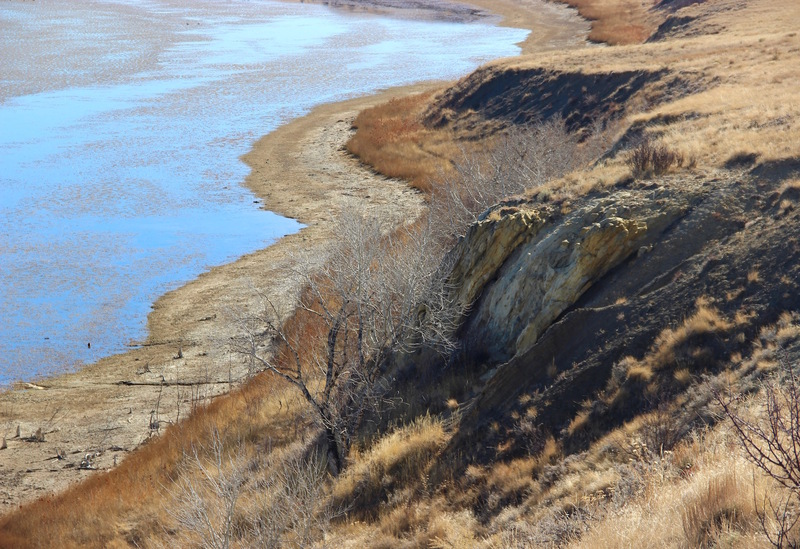 At the lower end of the canyon, the UMG suddenly disappeared at a fault bordering Browns Park, the broad valley of the Green River. Suddenly we were strolling among Tertiary rocks—fine sediments and volcanic ash that filled the valley just 10-20 million years ago. Since then, erosion has set the debris moving once again … down the Green to the Colorado River and points beyond. 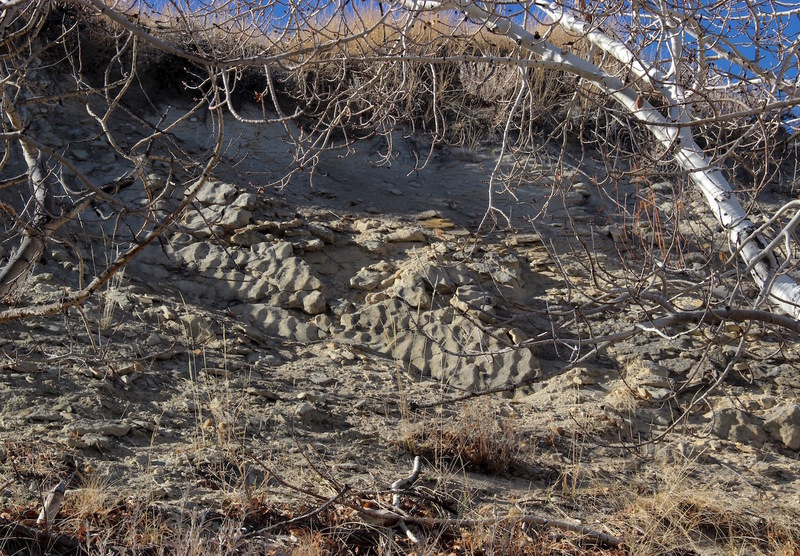 Pale outcrops against dark red slope behind mark Browns Park fault. 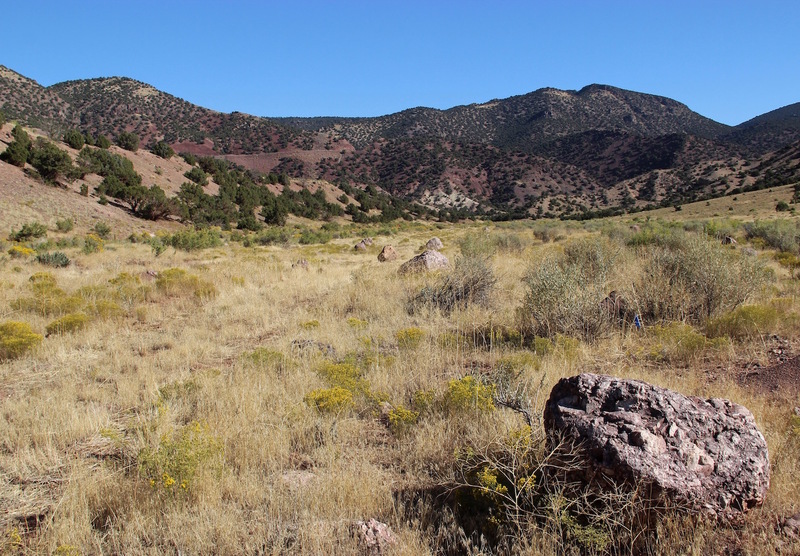 Boulders are Jesse Ewing Canyon conglomerate. Fittingly, Jesse Ewing Canyon memorializes a geologist … of sorts. 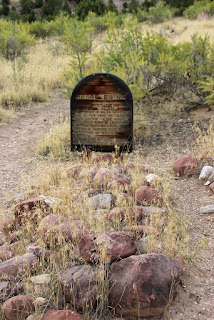 Prospector Jesse Ewing lived in a cabin near the head of the canyon. He had a bad reputation, with at least one murder to his name. He himself was murdered in 1885, “ambushed by Frank Duncan in dispute over the affections of Madam Forrestal,” a former resident of the Rock Springs red-light district. 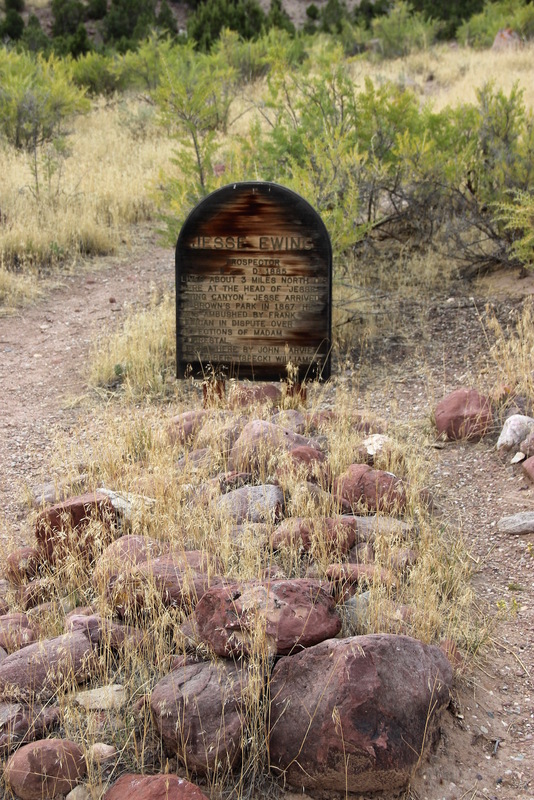 Ewing was buried at the Jarvie Ranch by John Jarvie and Albert Speck Williams. 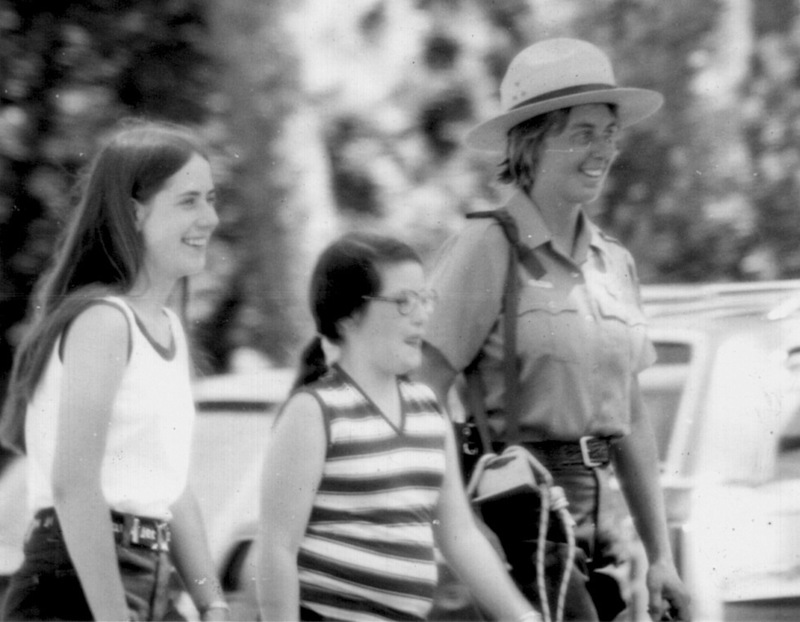 Twenty-four years later, Jarvie was murdered, by drifters from Rock Springs. Far from civilization, Browns Park was a rough place to live (more here). 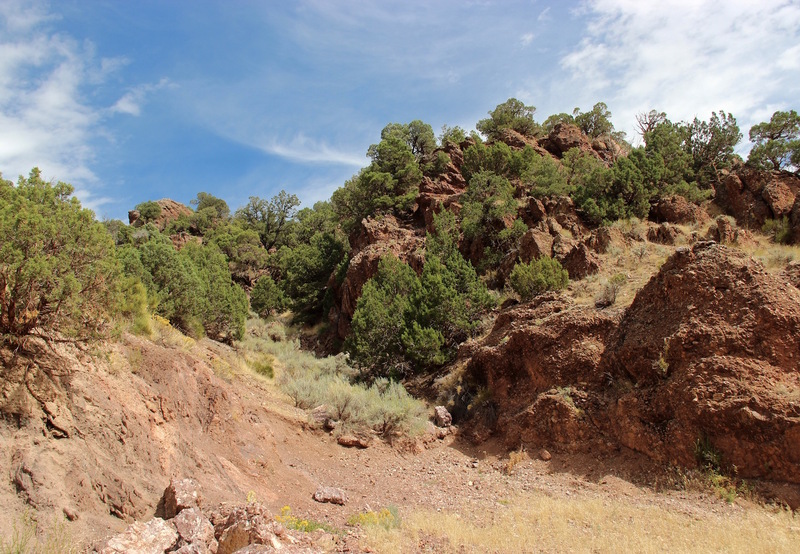 Start the Jesse Ewing Canyon Geo-hike from either the top or bottom of the canyon (do you prefer to go forward or back in time?). Or maybe do a loop if you want to look at cuts along the paved road—it’s not heavily-traveled. Numbered signs mark a pipeline route. Note Paleoproterozoic road cut right of center. Another view of the Browns Park fault. New road visible on left. Aalto, KA. 2005. 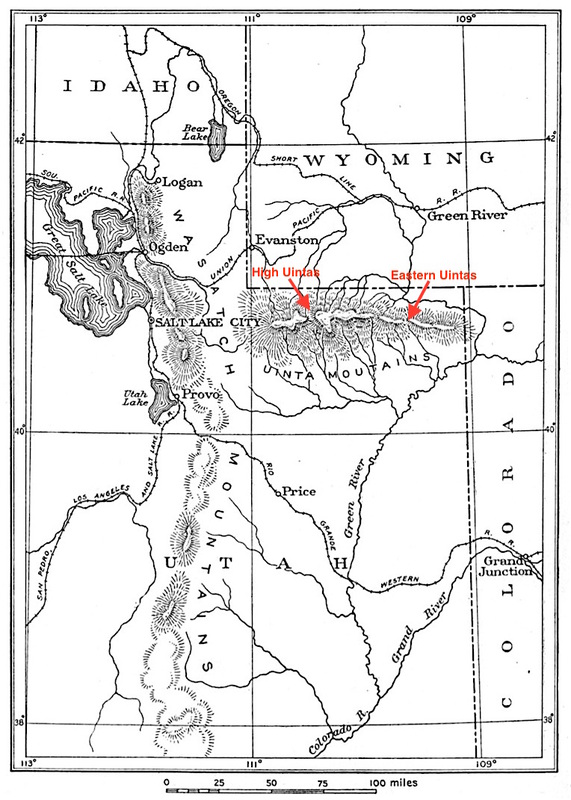 Pioneering geologic studies of the Uinta Mountains by the great post-Civil War surveys of King, Hayden and Powell, in Dehler, CM, Pederson, JL, Sprinkel, DA, and Kowallis, BJ, eds. 2005. Uinta Mountain geology. Utah Geological Association Publication 33. Dehler, CM, and Sprinkel, DA. 2005. 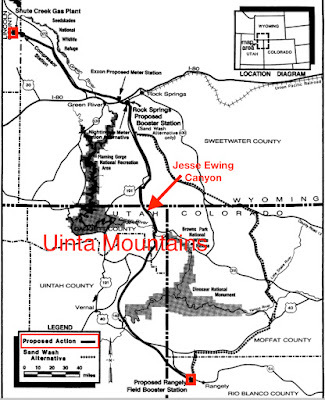 Revised stratigraphy and correlation of the Neoproterozoic Uinta Mountain Group, in Dehler, CM, Pederson, JL, Sprinkel, DA, and Kowallis, BJ, eds. 2005. 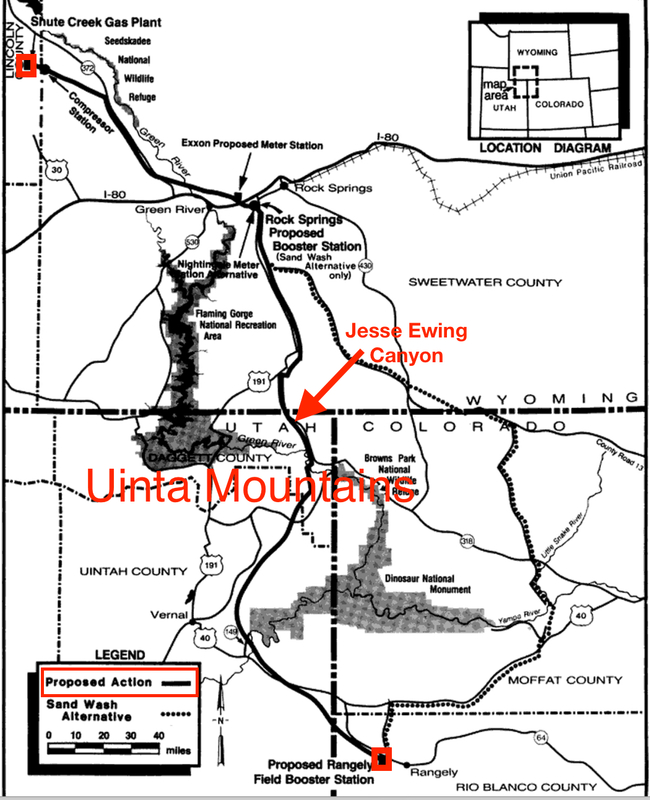 Uinta Mountain geology. 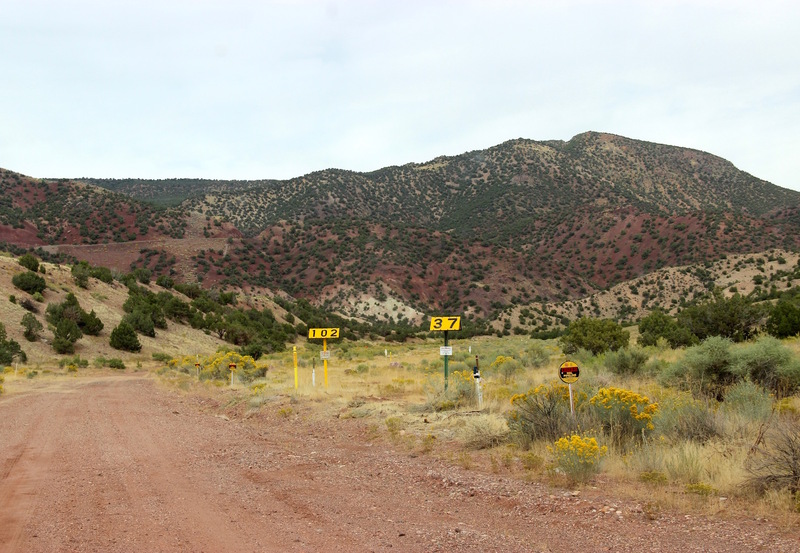 Utah Geological Association Publication 33. Hayden, FV. 1871. Preliminary report of the United State Geological Survey of Wyoming, and portions of contiguous territories. Washington: Government Printing Office. Tennent, WL. 1981. John Jarvie of Brown’s Park. Bureau of Land Management - Utah; Cultural Resources Series No. 7. Available here.